What is a robot? Robotic devices are anything which we make to take over a job which is boring, repetitive or dangerous to humans. Start by doing a 'robot walk' round your classroom - what can you see which has been invented by humans to make life easier, quicker or safer? You can make a simple robot from everyday materials. 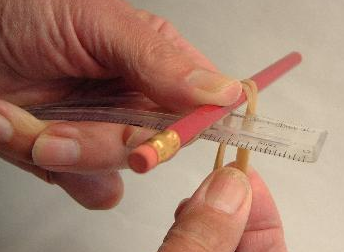 Stage 1: if you are using long rubber bands, double them up; if you are using small ones, use several. 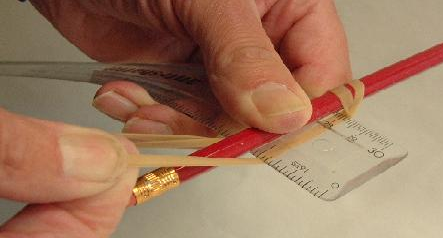 Stage 2: the rubber bands need to provide a firm fixing, so they need to be tight. 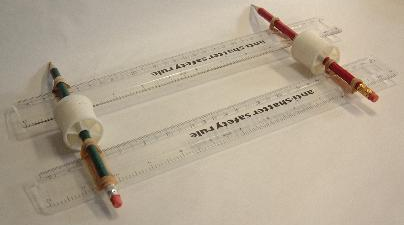 Stage 3: use the rubber band fixing technique to construct a basic unit that looks like the one below. Stage 4: attach the electric motor and battery holder with blu-tak or plasticene. The rubber drive band to the cotton reel needs to be only slightly tight. Stage 5: when the electric motor is connected to the battery, the cotton reel should rotate. The basic unit can be made to imitate a robot buggy. It can also imitate the winding drum for a robotic lift, the drum of a washing machine, and lots of other robotic devices. Stage 6: once you've got your robotic buggy going, see what you can find out about it. How far can it go? How fast can it go? If you make a few of them, you could race them! 2D representations of 3D shapes. Technology. Collecting data. Processing and representing data. Investigations. Design. STEM - design technology. STEM clubs. Maths Supporting SET. Practical Activity. STEM - physical world.